This is a basic recipe for fried rice that you can add to as desired. 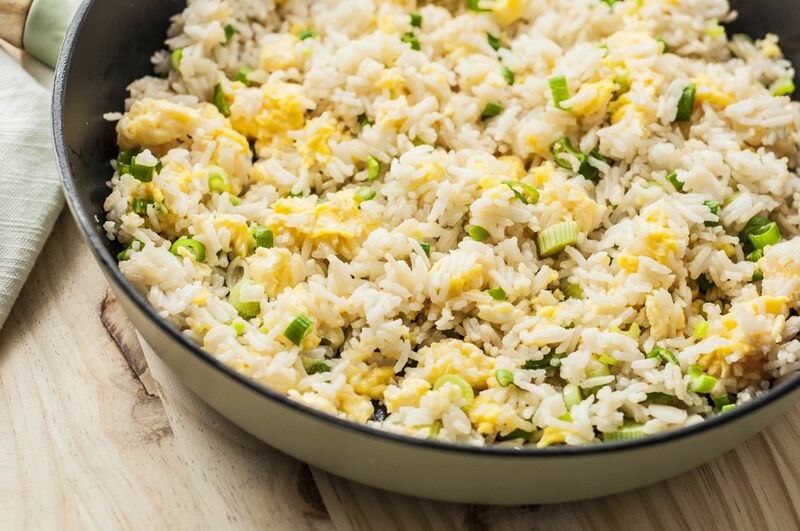 You can also try this egg fried rice. Tasty potstickers are the easiest Chinese dumpling to make. This recipe has been reader-rated at 5 out of 5 stars and includes an easy dipping sauce. An easy variation of the popular restaurant recipe beef lo mein, made with Ramen noodles. Pork chops are paired with stir-fried vegetables in a tangy sweet and sour sauce. Kung Pao chicken is often served during the Chinese New Year season. This stir-fry recipe has a little less heat than what is found in many restaurant versions of Kung Pao Chicken, making it easier to pair with wine, beer, or spirits. It includes a nutritional breakdown. Canned pineapple chunks and cooked shrimp give this dish the flavor of classical pineapple fried rice without the work. This spicy Szechuan chicken recipe gets its heat from Tabasco sauce, cayenne pepper, and crushed chilies. Parboiling or "oil poaching" the chicken in hot oil helps make it extra tender. Cold noodles are topped with a tart dressing made with balsamic vinegar and hot chili oil (available in Asian markets). The Chinese believe three is a lucky number. This is a variation on the classic dish Moo Shu Pork, using chicken breasts and flour tortillas. Leftovers taste great reheated for lunch the next day.